Así como la vida nos da sorpresas, el Mago Alberto nos trae rarezas, como este disco de Santana pero sin Santana. Un buen disco como para empezar el dìa con el mejor rock santanesco. 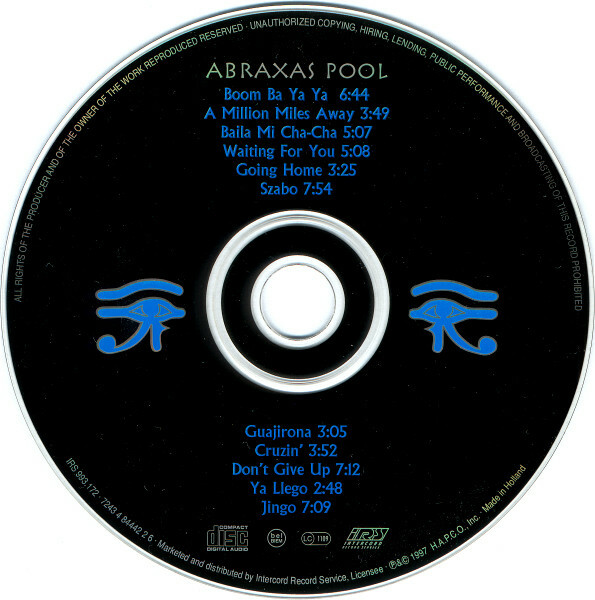 Abraxas Pool es un álbum de estudio lanzado por los músicos ex-Santana Mike Shrieve, Neal Schon, Gregg Rolie, José "Chepito" Areas, Alphonso Johnson y Mike Carabello. Rolie y Schon habían trabajado juntos también en la banda de AOR Journey. Un trabajo bastante extraño, particular, esto es Santana sin Santana, si, los integrantes de Santana de la primera formación, pero sin el Carlos. Por supuesto hay guitarra, si bien no esta el famosísimo y singular sustain del Carlitos, pero esa ausencia no se nota para nada, al contrario la version de Jingo es un ejemplo de esto, excelente casi diría mejor que la original. Para el seguidor de Santana este es un disco que encaja perfecto en la discografía, el clima y la fibra Santanesca está intacta al cien por cien, por supuesto no creo que este material haya sido difundido ni tampoco haya sido promocionado, pero eso no importa acá en el blog, le damos cabida a todas estas rarezas, enfermos, desauciados, terminales, etc. etc, para muestra basta un botón (lo tenemos al Vampiro). Temas que no te harán sentir la falta del chicano, hasta diría que hay unas perlas dignas de cualquier producción oficial del grupo. Discos como éstos son un referente de por donde pasa el sonido y el estilo de una banda, bueno, otra rareza que cae de perillas para el disfrute de los cabezones. 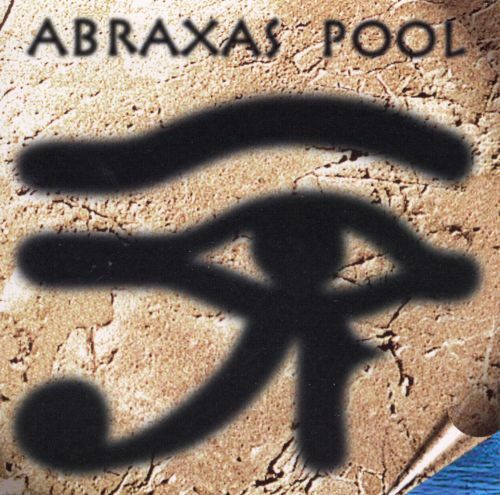 Despite the occultic name and implied Egyptian symbolism in this album's cover art, there is nothing mystic or magical in the sounds presented in the eponymous debut CD from Abraxas Pool. 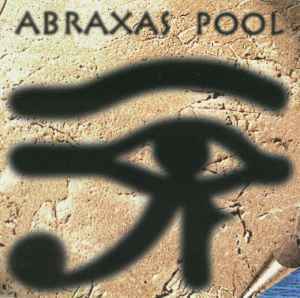 What the listener will find are well-crafted, produced, and performed songs in the mold of Abraxas/Amigo-era Santana, featuring veterans of the original band lineup and former members of Journey and Weather Report. This is an all-star affair, and includes much of the fire that made Carlos Santana's original entrée into the musical nexus of Latin, jazz, and rock so exciting in the first place. While Neal Schon more than adequately handles the Santana role on guitar, this recording really highlights the singing, playing, and writing talents of keyboardist/vocalist Gregg Rolie (the architect behind the pre-Steve Perry Journey sound). Fans of Santana's jazz-tinged Latin rock, and those pining for the more halcyon days of classic AOR, will not be disappointed. This is Santana, the original one, without Carlos Santana. Due to better recording techniques to listen this release is really a marvelous experience. Drums of rhythm section remains the same with the addition of an extraordinary bassman: Alphonso Johnson. The group intends to reproduce the original sound of Santana 30 years later and the result is fabulous. You will have Gregg Rolie and Michael Schrieve at their best. Neal Schon very respetousely plays his best a-la Santana, and he succeeded. Thanks God! This is a lovely, awesome and very valuable release by great musicians. This is the real band that was previously called Santana as opposed to the dude whose last name is Santana. This sounds far more like the BAND called Santana and their first four albums than anything the dude with the name Santana has done. If you like the first four Santana albums, this is essentially the same band and the same style of music without Carlos Santana. Which is not really a big deal, considering Neil Schon was by leaps and bounds the more talented guitarist in the Santana band. His sound was just not what was the most recongizable, being as Carlos Santana was the dominant guitarist on the first three albums. This sounds a lot like the first two albums with the obvious exception of it being far better produced and arranged, mostly due to technology differences. As the first two Santana albums were a bit rough around the edges this is slicker production. But the slicker production adds to the quality of the sound, it does not detract. I have always thought that Neil Schons guitar work was a bit over the top after the first few Journey albums with Steve Perry. His rapid fire noodling tends to get a bit monotonous when he overdoes it. .
That is the case on this CD. I think he could have cut back on the lightning fast leads in favor of something more melodic and less showy. The guitar work here sounds more like his solo jazz music, only a bit more overdone. But, in all this really does sound like the real Santana. Gregg Rolie was really the main dude in the band called Santana, given he played the prominent organ and did the most recognizable of the vocals, whereas Carlos Santana played guitar and didn't sing. I also always felt that Mr Rolie was the superior songeriter in Santana. And of course the percussion for Santana is here, which was also ( like Mr Rolie) a far more important ingredient to the Santana sound than Mr Santanas guitar work. So in summary, this sounds like what you would expect from the guys that bailed from Santana, it sounds like the first four Santana albums with much more up to date production and Neil Schons fiery guitar work. I consider this to be essential to anyone who liked the band Santana during their most popular period. Los seguidores de Santana estarán como locos con éste disquito. Imagino que ya saben dónde encontrarlo... Que lo disfruten!